First of all, please forgive any typos you may see in this post. Typing is difficult today since I burned the middle finger on my right hand yesterday in a tragic peanut brittle accident. Some of the candy dripped onto the back of my finger as I was pouring it into the pans for cooling. Burned it good (especially since I couldn’t get the candy OFF my finger right away). I’m typing much slower than usual because of this because I can’t use the injured finger without causing pain. And I don’t like pain. Therefore, my right ring finger is doing its best to fill in, but it’s unaccustomed to it. And for some reason, not using my right middle finger throws off my left hand too (not sure what’s up with that), so there may be errors I don’t catch. Hard to believe that Christmas is only a few days away. This year has flown by and today I find myself looking back. It’s been crazy! This year has brought many changes into my life. My oldest child going off to Africa to serve a mission for our church was the biggest and most dramatic (he’s doing well, by the way). I had my first car accident at the end of July (still having a few issues from that). Another big change that happened shortly after that was pulling my kids out of public school to home school them (that’s going well so far, but we’ve planned changes that will start in January). I made lots of new crafts and enjoyed being creative. Speaking of creativity, my writing life has been a bit slower due to some of the changes that happened in my “regular” life. Still, I managed to learn more about the craft of writing, read many amazing books by many amazing writers, write a few things of my own, and come out stronger and wiser. Would I like to have seen things end up differently this year in regards to my writing life? Yes. Of course, I would love to have signed a contract for one of my books (who wouldn’t—well, besides those who did), but that’s out of my control. I did write and revise and query, and that’s all I can do. So, even though I wish for more, I’m happy with what I HAVE accomplished this year. Of course, there are several days left in this year, but I don’t expect anything to change in regards to my writing life at this point. I want to thank all my friends and family who have helped and supported me—both in my writing endeavors and in life. I can’t do this alone, and I know it well. May all of you have a happy holiday season, and may the new year bring wonderful things for us all. Today I’m taking a moment to stop in and share one of the most beautiful book trailers I’ve ever seen. I wanted to read the book anyway (and have pre-ordered my copies), but, after watching the trailer, I wish it were already released (not until Nov. 4th). Anyway, the trailer is for FORBIDDEN by Kimberley Griffiths-Little (if I can get it to embed correctly). And you can check out her website HERE to enter the giveaway. There are amazing prizes including a Kindle Fire!!! What books are you looking forward to curling up with this fall? Happy Columbus Day? Yep. It’s here. That glorious day when we celebrate/honor the man who “discovered” America even though we all know by now that he didn’t even reach North America. I’m not sure why we continue to have a Columbus Day—other than it’s an excuse for Federal Employees to have a day off. Not that Columbus wasn’t a great explorer. I mean, I suppose he was. But there are other explorers who did great things and we didn’t give them their own special day. But while we’re talking about Columbus, I heard something amusing the other day. I can’t remember what I was watching on TV or who said it—and I’m not even sure I can remember the quote exactly—but it was about Christopher Columbus. The person said that Columbus was an excellent salesman. He convinced Spain to pay for three trips across the ocean to find a route that he never did find. So true! I mean, Columbus got lost, was confused about where he landed, and lost a few ships and men along the way, but he still managed to convince the rich and powerful king and queen to continue to pay him to do these things. But why celebrate Columbus? If we just need a Federal Holiday in October, let’s celebrate a wonderful North American! There are so many who have done wonderful things and deserve our recognition. But I suspect it won’t ever happen (though I heard that at least one state celebrates this day as Native American Day—I think it’s Washington, but don’t quote me on that). But here in Arizona, we will continue to take a day to celebrate Columbus. There will be parades in some areas (and there probably were in some other cities/towns in AZ—but not in mine). There will be children who glory in the day off from school. And there will be sales in stores. Speaking of sales. I’m off to take advantage of them. Not that I want to, but necessity is a great driving force. My washing machine broke. And we are choosing replacement over repair. Sure, I could wash my clothes by hand like my poor oldest boy who is over in Africa (don’t worry, he’s in Accra, Ghana, where Ebola hasn’t reached—and hopefully never will), but I don’t wish to wash my clothes by hand. And since I don’t have to, I won’t. After my shopping trip (and after getting my washer installed—because I don’t intend to come home without one—clean laundry is something to which I’ve become accustomed), I hope to get some writing done. I hope you all enjoy your day! We don’t really do anything special to honor Columbus here. Do any of you do anything? Okay, so Halloween is coming up and so is Fall. Because I enjoy doing craft-ish things, I couldn’t resist when my hubby showed me a link on Facebook that took me to the Mason Jar Crafts Love site. There are so many fun projects there! I chose a couple that I loved and got to work. I spray painted the outside with Krylon Color Master paints (they stick to glass better than some of the other paints). Since the outside is painted, I can put things on the inside. 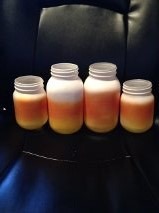 Like candy corn candies. Or maybe some LED lights or something. I’m still thinking about what to do with them. But I couldn’t resist making them because they’re so adorable. Or maybe it’s just me. SOOO adorable. I put solar lights in the lids for the two on the sides. 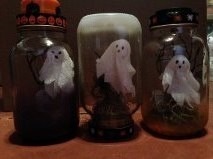 The one in the middle is an upside down jar one with no light. 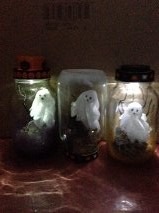 I turned the lights off for this picture so you could sort of see what they look like lighted. It’s hard to see, but the two with lights also have little RIP headstones in the ground next to them and really creepy trees behind them. 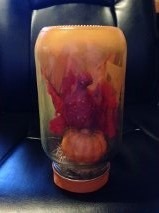 It’s got some little Styrofoam gourds inside with Fall leaves behind the gourds and Spanish moss on the bottom. I’ve got more jars planned and am looking forward to working on them (like the one on the website with the spiders and webbing inside—though I may change it up a bit like I did with some of these). So that’s my Friday Freaky Fun. How was your day? Things here have been—interesting. I’ve been doing quite a bit of revising on my new middle grade novel, which has been a blast. No. Really. I’ve very much enjoyed doing revisions this time around. I just finished another go at the manuscript and made some pretty good changes. Now I’m waiting for feedback before I’ll attack it again. So, in the meantime, I’ve been pondering ideas for future books with these same characters—for the just in case. I’ve been jotting down notes and bits of dialogue and whatever else comes to mind. And in the middle of all of this, something strange happened. On Monday morning—just before 3am—I woke and couldn’t go back to sleep. This happens to me sometimes. Usually I lay there and generate ideas that I can jot down. This time I had these lines running through my head. I couldn’t jot them down. No. That wasn’t good enough. I had to get up, get out of my pajamas, put on clothes and shoes, and run through the pouring rain (yes, it was really pouring) out to my office. Once there, I flipped on my light, booted my computer—and it was agony to wait for it to turn on even though it’s quite fast—open a new document, and start typing. Once I got down the lines that had been running through my head, I kept going for about an hour—and would have gone longer if I hadn’t had to wake up my oldest daughter for her morning class. It was thrilling and not just because it was new and different. Because while the words and character are new, the concept isn’t. This is a middle grade I first wrote years ago and occasionally pick up now and then to tinker with. After my last tinkering, I had set it aside and figured I was done for good. But how thrilling to know that I’m not. This new character breathes life into this old story like nothing I ever imagined. Perhaps it will actually go somewhere this time—I’m cautiously optimistic. So as I’m waiting to do another pass at my completely new middle grade manuscript, it’s nice to have this old concept to make new again. In addition to this new/old writing, I’ve been planning and doing some cool fall/Halloween decorating projects. Maybe I’ll post some pictures when I’m done. How have things been going for all of you? Can you believe Summer is almost over? What are you doing in your last few weeks before Fall takes over? Ah, the weekend. Here it’s actually Rodeo weekend (that means there’s a rodeo happening—which is a big thing in my town) so things are crazy! The girls and I went to the parade this morning, though we didn’t stay through the whole thing. We only stayed long enough to watch J’s friend march with the high school band (she’s in the color guard). The friend has been staying with us while her parents are out of town (they’ll be back on Monday). I’ve never been a parade loving person. To me, they’re hot and loud, and I always seem to sit near someone who is smoking—I don’t like that. I’m not a smoker, and I don’t want to breathe in other people’s smoke. And to make things even more fun, prolonged exposure to smoke usually triggers a migraine for me (even if it’s smoke from a forest fire). I made sure no one around us was smoking before we sat down. But people kept showing up—like they wanted to watch the parade or something—and, sure enough, a man sat down behind us and started smoking (about three cigarettes in the hour and a half we were there). Thankfully, there was a breeze that helped blow the smoke away. I still have a bit of a headache, but it’s not bad so far, and I think I might have escaped triggering a migraine (oh, please let it be so). But we survived and are back home for now. K has a birthday party to go to later this afternoon, and I need to get some fuel in my car so I’ll have to go back into the crazy traffic later today. Oh, it’s been so long since I posted, I suppose I should catch you all up on a few things. First of all, I got a 2006 VW Beetle TDI (that means it uses diesel fuel). It’s green and we call it The Hulk. I even got a Hulk license plate for the front and some Hulk decals (one says “Hulk Smash Your Stick Family and has stick people trying to crawl out from under Hulk’s fists—I think it’s hilarious). But the main reason we got it is that it has amazing gas mileage—well that, and I always wanted one. Plus, the Expedition has some damage to the bumper from a lady smashing into the back of it while I was stopped at a light. That happened at the end of July. I’ve been seeing a chiropractor to help my neck and back since then (it kind of messed me up), but other than that, I’m okay. Just after I got the Hulk, I drove to NM to visit the amazing Kimberley Griffiths Little and attend her book launch party for THE TIME OF THE FIREFLIES (awesome book, by the way! !—review coming soon). It was so much fun! I also got to meet the incredible Nikki Loftin. I’d never read her work before, but I bought a few copies of her newest novel, NIGHTINGALE’S NEST, and had her sign them. Then I came home and read it (loved it! !—review of it coming soon, too). I intend to add her other books to my collection and can’t wait for her next release. It was an amazing experience and so much fun to have lunch with these wonderfully generous and kind authors. And another great thing about the trip? I had free time to do some writing (the launch party was on Saturday so I drove down Friday night and stayed in a hotel). It put me that much closer to finishing my new middle grade novel—which is some more good news. It’s been a long time since I actually finished a novel. Started many, though. And I LOVE LOVE LOVE this main character. She’s so much fun! Witty, smart, hilarious. And it made the story a joy—yes, a JOY to write. The words just flowed. I started writing it at the end of June—and even though it seems like it took a couple of months to write it, it really didn’t. I wasn’t writing every day or even every week. All total, it took me about three weeks of writing days to start and finish this novel. Amazing! And even if nothing comes of this new work (though I’m cautiously optimistic), it helped bring back the thrill of writing for me—and got me to finish something. So it’s worth every second of the writing time. So those are a few highlights since my last post. How have things been out there for all of you? So it’s Friday. The last weekend of freedom for my kids before school starts on Wednesday. Daughter 2 has wanted to go fishing all summer but things have been so crazy, she hasn’t had a chance to. Hubby, Son 2, and I all went fishing in June, but Daughter 1 and Daughter 2 were at camp so they didn’t get to go. We planned to go on Wednesday. Got in the vehicle, drove to the lake, and were met with a downpour. So we had to cancel. Daughter 2 was not happy. To appease her, we promised we’d try again this afternoon. Now we just have to hope the monsoon cooperates and stays away long enough for her to do some fishing. Anyway, all this planning got me thinking about how writing is like fishing. 1. It takes time. Just as it takes time to prepare to go fishing—loading up the car with poles and equipment, making sure the bait is good, packing snacks, etc.—it takes time to prepare your writing. First you have to write it—huge amount of time. Then you have to revise (and often let it sit for a day or two—or more—before diving into revisions) and polish. And even after all your planning and writing, things can still go wrong—just like the downpour. That project you started writing may not be the one you should be writing. You may fizzle out halfway through. You may get an even better idea and start writing that one. So if you encounter a downpour, be flexible enough to alter your plans—if you need to—and try again. Time. 2. It takes bait. Just as fish need bait before they’ll swallow your hook, so agents/editors need a good story. But we can’t just send them the story, they want a little nibble first. Thus we have a query. Sometimes, writing the query is more difficult than writing the book. The query has it’s own hook and bait. The hook has to be shiny to attract attention, and then the bait on the hook has to be tasty enough that the nibble will lead to wanting more—a request. Once the request has been fulfilled, the agent/editor will do more nibbling at your work. They’ll read it, see if they like it before deciding to really bite down—offer representation. Bait. 3. It takes patience. Once your hook is baited/query written and polished, you are ready to cast your line. In writing, this is the point where you send your query to agents/editors. You research their guidelines and tastes, then send your query out there. Ah, the dreaded waiting phase. Here we have to wait for a bite. Sometimes we’ll get completely rejected—the agent/editor fishies won’t even nibble. Other times, a few nibbles will occur—you’ll get requests for a partial or full—but as often happens with nibbles, the fish get away. For some reason, the bait/manuscript wasn’t quite enough to get that bite. And we all want that strong bite we can real in to find a contract on the end of the line, but it often doesn’t happen right away. It can—and often does—take years and may even take many different manuscripts (baits) before we are able to catch an agent/editor. Patience. 4. It takes persistence. If we aren’t able to catch an agent/editor with our bait, there comes a time when we need to switch it up. A completely new manuscript/bait might do the trick. So we start over baiting our hook and casting our line out again. Sometimes we get the same results, but giving up isn’t an option. We keep trying new baits and throwing out our lines until we get the fish we came for. Again, this can take years. We can’t catch a fish with our first try (though there are exceptions—but it’s not the norm). We have to find what works. What makes the fish bite? We have to read work in our genre, write work in our genre, and keep trying. Persistence. 5. It takes cleaning. If you are one of the lucky ones to catch a fish, it isn’t over. Now you have to clean it. No, I’m not talking about gutting the agent/editor. I’m talking about your manuscript. Very rarely will there be a manuscript that doesn’t need some revision after signing a contract. Writing is work. And if you’ve signed with an agent, there may be more revisions/gutting when you eventually find an editor. Cleaning. So writing is like fishing. It’s not an easy process, but the end result is worth it. You have a beautiful fish that you worked for. This fish will feed your writing soul and help get you closer to your dream of dinner—er a published book.